Joe Duplantier once told me during an interview that the way he sees it, the way the music business works these days, CD's are there to promote the touring band, whereas in the past, the touring band promoted the CD. Touring ought not be necessary to promote the new CD by Duplantier's band, Gojira. It has it's own life. It calls out to the entire world to be heard and revered. The term 'instant classic' probably doesn't make sense if you think too much about it, but I don't really care: In my book, 'L'enfant Sauvage' is a landmark of heavy music. The previous efforts by the Frenchmen are excellent in their own right and have offered the metal community a slightly different and very refreshing take on metal song writing. 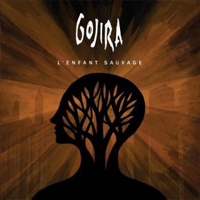 Nevertheless, 'L'enfant Sauvage' is a refinement of Gojira's past glories. A tad more accessible this time, but still with a sound and riffing that is uniquely their own, Gojira present an album which is nothing short of awesome. Melody, brutal, tight power and just enough complexity to offer you something new everytime you listen come together in a symbiosis unlike anything else out there right now. This is one of those albums that almost refuses to leave my CD player! Come January 2013, 'L'enfant Sauvage' will be one of the albums which hordes of reviewers will have on the 'Best of 2012' list, I'm willing to make a bet on that one! A true masterpiece!